Four Roses is the only distillery which uses two mashbills and 5 yeast strains to create 10 distinct single barrel bourbon recipes. They differentiate each unique recipe using four letter designations. The first letter "O"(indicates production in Lawrencburg) and third letter "S" (indicates straight whiskey) are constants, while the second letter indicates the mash bill and the fourth letter indicates the yeast strain. Nose: Vanilla bean and powdered sugar hover right on top of my glass. Cherries and a spike of mint follow. There is a substantial toasted oak presence as well as a whiff of cinnamon that is just mouthwatering. The overall bouquet is enhanced by a thick layer of baking spices. Taste: Rich and flavorful. An intense spice coats the mouth with waves of black pepper, rye, and spearmint. The sweetness is reminiscent of a Moon Pie, with caramel, marshmallow, and a bit of graham crackers. Finish: Medium in length with an intense dry and spicy bravado. 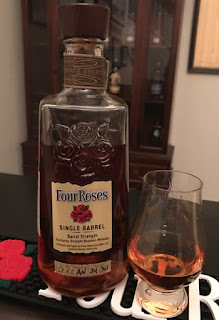 Conclusion: This OESK single barrel is simply delicious! It's full-bodied, complex, and well balanced. I love this particular recipe because it highlights the spice but doesn't over do it as it uses the lower rye mashbill. For the price, this is also an amazing value. Smooth Ambler's Contradiction is a blend of two straight bourbons. The majority of the blend (73%) is a 9 year, high rye bourbon; the rest (27%) is a 2 year, wheated bourbon. The rye is distilled at MGP in Indiana while the 2 year wheater is produced by Smooth Ambler themselves in Greenbrier County, West Virginia. 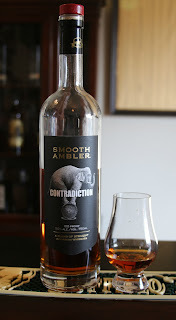 Smooth Ambler recently announced they are having trouble keeping up with supply and demand for their sourced whiskies. They are “taking a break” by suspending their private barrel program in 2017. I wonder if this will affect future releases of Contradiction or other sourced blends going forward. On a brighter note, they also announced an upcoming release of their very own 5-6 year old wheated whiskey (available in the gift shop only). Nose: Sweet wheat, cinnamon powder, and rye bread. A grainy element exists in the aroma but is masked by a sharp pepper spice. Taste: A swirl of sweetness, fruit, and spice. Red-hot candies sweeten up the palate, followed by notes of Hawaiian sweet rolls, mint, and oak. Finish: Medium with a fading sweetness smothered by black pepper spice. Conclusion: This has to be one of the most appropriately named whiskies I’ve ever tasted. Elements of both the younger wheat bourbon and the older rye bourbon play opposing roles which adds a unique complexity to the spirit; at times it’s sweet and grainy, and at times it’s sharp and spicy. If you find this at a reasonable price it’s a fun experiment bourbon, but I would be contradicting myself if I picked up another bottle in the near future.